Our Casino Gift Items are ideal for casino/gambling enthusiasts of all stripes. Choose from a number of unique Casino Novelties, including our popular Poker Chip Key Chains and Antique Gold and Silver Domino Key Rings. These Metal Poker Chip Key Rings are a great gift idea for any poker lover. The Poker Chip Keyring holds most standard casino chips, and it has an easy to remove top for chip replacement. 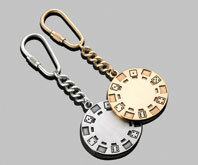 Featuring a brass finish, these Poker Chip Key Chains are 1½" in diameter. These 33" Card Suits and Dice Necklaces feature each of the four card suits separated by dice. 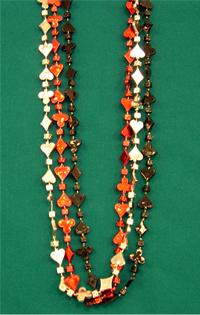 Our Card Suit Necklaces come in sets of three necklaces, in black, red, and silver. Our Gold and Silver Poker Chip Key Rings will bring you some luck next time you say your "All In". These Poker Chip Key Rings are available in both Antique Gold and Antique Silver and are great for corporate gifts and promotional giveaways. Each Poker Chip Key Ring comes packed in a black velvet pouch. Order on line through our secure store 24/7. 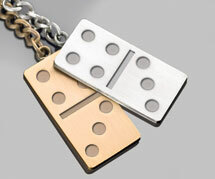 Our Gold and Silver Domino Key Rings are great gift idea for company outings and promotional events. Each Domino Key Ring is available in your choice of either an Antique Gold or Antique Silver Finish and come packed in their own black velvet pouch. Order on line 24/7 through our secure shopping cart. Feel free to browse our other many other Casino and Gaming Products, including our Casino Night Supplies, Casino Playing Cards, and our Casino Theme Decorations and Decorating Kits. For additional information on any of our items, contact usat 1-800-233-0828.